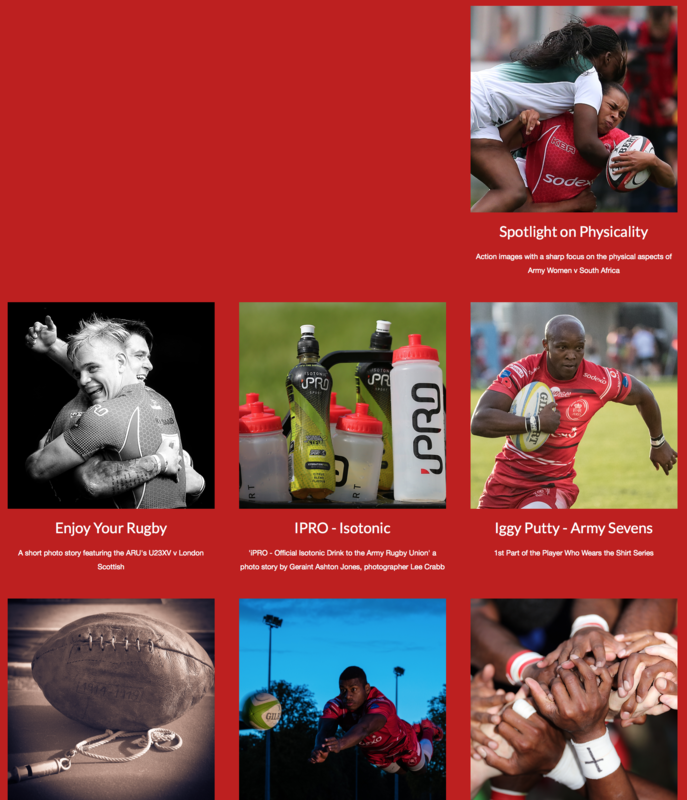 This is a photo story article we produced for our client, Army Rugby Union, and is part of a series of photo stories that can be viewed at the Army Rugby Union Media Portal - photo stories. In this story we have used heavy vignetting to try and focus the view on only part of the image showcasing some of the facial expressions caught by the camera during a physical match. A quote from the match report on the Army Rugby Union website: "It’s a measure of where Women’s Rugby has come from in the Army in that our representative side can field a Development side, that in itself had a couple of capped UKAF and senior Army players on the same afternoon that the senior Women would face the toughest challenge of their 20 years since the formation of a representative team." If was the toughest challenge in more ways than one. The recent match against the visiting South Africa team was probably one of the most physical women's games played at the Army's Aldershot Stadium. A full match report can be viewed on the ARU website (link high lighted above) but to showcase some of the commitment shown during the match we have reprocessed a number of images from Lee Crabb to spotlight the physical nature of the match. Picture above Capt Chantelle Miller feels the force of a double tackle from the South Africans.. Left - Cpl Jade Mullen puts her body in the way of on coming traffic. Below - Sgt Tara Miller trying to force through another robust tackle. Above Left - Cpl Lou Dodd looks to break through a gap in the South African defence. Above Centre - Pte Ellie Gattlin struggles to free her arms to get the ball away. Above right - Cpl Heidi Silcox finds progress difficult in the face of another double tackle. Below Left - Sgt Tara Miller finds the odds stacked against her against more robust South African defence. Below right - OCdt Sally Stott brought to ground as the South African's showed no let up in the tenacity of their defence. The game undoubtedly shows that the Army Women's team is continuing to develop and with up coming matches against Germany, Holland and England U20s they will certainly have had a testing preparation prior to their first Inter Service match away at RAF Halton. The 2017/18 fixture list is clearly a sign of respect for the rapid strides made by the RAF Women side over the last three years and Women's rugby can only benefit if the two teams produce another encounter that matches their game from the end of last season. As ever my thanks go to Lee for another great set of images and as we continue to build our series of photo stories you can now view all of the previous editions on their own dedicated page. Click here to visit the photo story archive. All images were reprocessed using a heavy vignetting to isolate the players faces during contact in the match with the aim of capturing some of the physical and emotional aspects on show during the game. Above - Capt Erica Mills tries to hold on in to the tackle despite a forceful fend. Left - Sgt Amy Robinson looks to break through the tackle. Below - Second image of Capt Chantelle Miller from the tackle depicted in the opening image.